Kay Stone, folklorist, storyteller, writer, and artist, was born in Detroit, Michigan and raised in Miami, Florida. She heard her first stories in the 1940s when her father told her very tall tales about the animals he saw while driving his gasoline tanker across the wild Florida everglades. She herself didn’t begin telling tales “officially” until she and her husband moved to Winnipeg in 1969. Here she started her teaching career at the University of Winnipeg, where she taught folklore, children’s literature, and storytelling for almost 30 years. She began giving workshops and performances for teachers and librarians in 1975, and has happily continued with these activities in her retirement. In addition to schools and libraries, Kay has given workshops and performances at the Winnipeg Art Gallery, the Manitoba Children’s Museum, The Manitoba Museum, the Winnipeg Folk Festival, and the Winnipeg Fringe Festival, among others. She has also been part of storytelling events throughout Canada (notably several times at the Toronto Festival of Storytelling), in the United States, and in Hungary. Her professional organizations have included the American Folklore Society, the Folkore Studies Association of Canada, the National Storytelling Association (U.S.), the Canadian Storytelling Association (SC/CC), and the newly organized Manitoba Storytelling Guild, of which she is a founding member. She is also a founding member of Stone Soup Stories and Eldertales, two informal groups that have been meeting regularly for open storytelling since the 1980s. 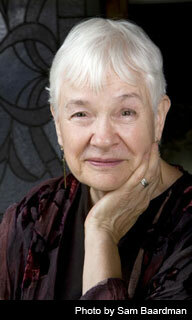 Kay has written three books (see BOOKS): Burning Brightly, The Golden Woman, and Some Day Your Witch Will Come. She is presently working on a collection of her own stories. For a sampling of photos, and also some of her wire-mobile artwork, check IMAGES. The Manitoba Storytelling Guild (2008), an umbrella organization for other storytelling organizations and individual tellers throughout Manitoba. The guild sponsors workshops, storytelling concerts, and mentoring programs. Stone Soup Stories of Winnipeg (founded 1982) An informal gathering of tellers of various backgrounds and interests. The group meets monthly at the Fireside Room at the Unitarian Church (603 Wellington Crescent) and is open to anyone who wishes to practice the art of storytelling or of listening. Eldertales (founded in 1994) is a group of senior tellers who gather monthly to choose and practice traditional and personal stories to be told in local school, seniors' centres, and other venues as requested. The group meets at Creative Retirement on Sherbrook Street on the second Tuesday of every month, from September through May. Kay is also a founding member of Earthstory, a storytelling trio, with Mary Louise Chown and Jane Cahill. Earthstory (founded in 1991) is a trio of women (Kay Stone, Jane Cahill, Mary Louise Chown), all experienced tellers who have performed traditional tales and myths, individually and together, over the past decade. They have appeared in a wide variety of venues that include the Winnipeg Fringe Festival, the Winnipeg Art Gallery, the Manitoba Museum, Manitoba Children's, and a number of educational conferences, and most recently as part of a concert series of stories and music, The Magic of One. For more information see EVENTS.